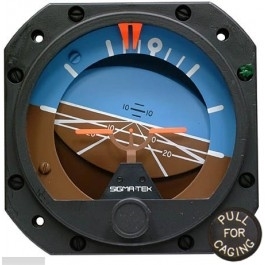 Sigma-Tek Attitude Gyro 5000M-6. 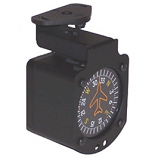 Sigma Tek Vacuum Horizon Gyro 1U149-023-3 in an air driven attitude indicator with an incline, and 8 degree panel tilt. 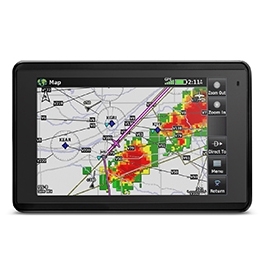 The 5000M-6 cage feature provides quick erection when needed after short stops, or after aerobatic maneuvers. 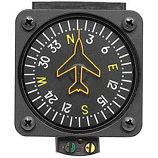 The air-operated artificial horizon gyro is selected as standard equipment by aircraft manufacturers worldwide. 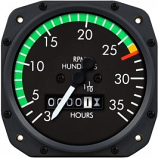 The artificial horizon displays aircraft attitude through 360 degrees in pitch. 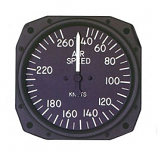 Its pictorial presentation gives faster interpretation of airplane attitude with blue for sky and brown for ground.